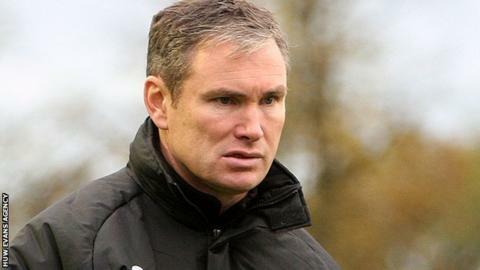 Wrexham manager Kevin Wilkin admits he is under pressure ahead of his side's trip to Dover on Tuesday. The Red Dragons lost 4-0 at home to bottom-of-the-league Telford on Saturday, leaving them in 16th place in the Conference and 10 points adrift of the play-off places. Wilkin, who criticised his side after that game, says he will make changes as the club's promotion hopes fade. "Under pressure? Clearly, if I'm not achieving at home," he said. "With the greatest respect to Telford, they were hungry and had that bit of desire. "That's what I need to bring back to Wrexham Football Club. Am I under pressure to do it? Possibly I am. "I've made a lot of changes with the money that I've spent. I'm comfortable with the money I've had to spend and where I've spent it. Is there an expectancy to be too successful too soon? Maybe." Bottom-of-the-table Telford shocked 10-man Wrexham at the Racecourse Ground on Saturday. Wilkin has signed Scunthorpe centre-back Luke Waterfall and extended Stoke goalkeeper Daniel Bachmann's loan until the end of the season so far this January. But he is ready to make more changes to his squad before the transfer window closes at the end of the month. "The people I've been able to release from the club and those that I've brought in, I don't think too many people will question that," said Wilkin. "But ... I need players with a more hardened attitude and a more ruthless streak through what they are. "We need to show a better level of consistency." Wrexham are six points behind 12th-placed Dover, who thrashed relegation-threatened Dartford 6-1 on Saturday. "It's not going to be easy to go there," said Wilkin, before adding: "We have tended to show better away from home than perhaps we have at home this season." He continued: "Players need to step up to the plate now, get that badge on their heart and wear it with pride. "I know we are in a better place now than when I took over and I'll continue to drive that forward."